Do you find yourself scrolling through social media timelines while waiting for anything longer than thirty seconds? I’ve been guilty of this lately. Earlier in the week, I saw a video that caught my eye and stomach. Maybe because I had most of the in gredients – well the mozzarella and parmesan cheeses – this one made it onto the ‘what to make this week’ list. Also, I was completely intrigued by new uses for a springform pan, having only ever used them to make cheesecake. I substituted greek yogurt for ricotta and it tasted yummy anyway. Be sure to make more pasta than you need, otherwise you’ll delay the whole process by about 8 minutes. Boil 1/2 bag of Rigatoni pasta (about 1/2 pound or so) in salted water. I didn’t measure the water but made sure it covered all the pasta. Set the timer for 8 minutes, pull the pasta off the stove when it goes off. Transfer to a bowl and toss with 1/2 tablespoon olive oil, 1/2 cup of each of the cheeses. Grease the bottom and sides of the pan. Make sure clasp is securely closed on the side. Cover bottom of pan with pasta sauce – 1/2 cup. 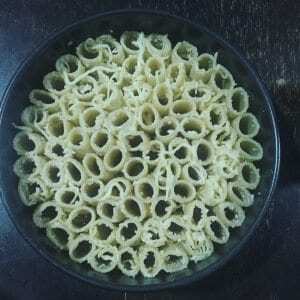 Stand the cooked pasta up inside the pan (as shown in photo above). You can also season the pasta for extra flavor. Mix yogurt, egg, salt and pepper together, pour over the standing pasta. Make sure to get as much of it inside the tubes as that’s what will cook it further. Layer on top with pasta sauce and pepperoni (if using). You could also use veggies to treat this like a pizza. We ate it more like a pasta pie. Bake at 400 F for 30 minutes. 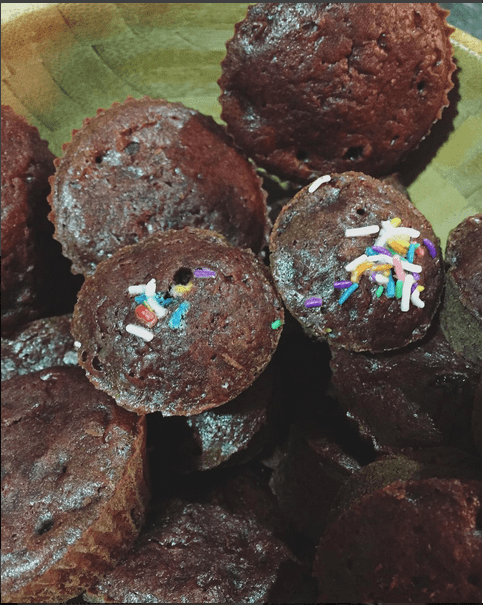 Enjoy the yummy goodness. A friend’s birthday inspired me in my latest baking adventure: Pineapple upside down bundt cake. Never eaten one before, so after a lot of research, I dove in. Two things to mention: you could make the cake batter from scratch. But if you’re reading this blog, your life is probably as busy as mine, so my directions recommend using a yellow cake mix. Second, I used fresh cherries because those were all I could find. Didn’t seem to make much of a difference from the standard Maraschino syrup soaked ones, taste wise. Make the cake mix as directed on the box. Most of them will ask for 1 1.5 cups of water. This is where you can substitute the pineapple juice, if you are using some. Melt the butter, and grease the bottom of the cake pan. Grease all of it if you’re worried the cake might stick (as I did with butter spray). Scatter the brown sugar evenly around the bottom. This will make a sugary brown glaze on the top when you flip it out and also trickle down the sides to make it extra yummy. 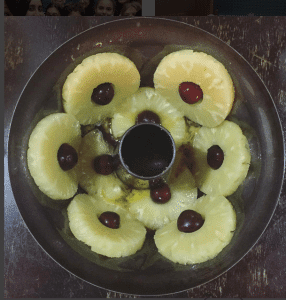 Place the pineapple slices into the pan. you can balance them on the edges of the lower pieces if using a curved pan like the bundt style. As you’ll see in the photo, I cut the lowest slices in half to go around the funnel. Place stemless cherries in the center of each ring. Pour the batter in. Cover all the slices as they will embed into the cooked cake. Bake at 350 F for 40-45 minutes or until a toothpick comes out clean. Wait 10 minutes. Slide a knife around the insides. Then flip over in one go (or it will break). Don’t wait too long or the top will get stuck in the brown sugar glaze. Refrigerate until you serve. The fruit will get heavier with time so keep that in mind.